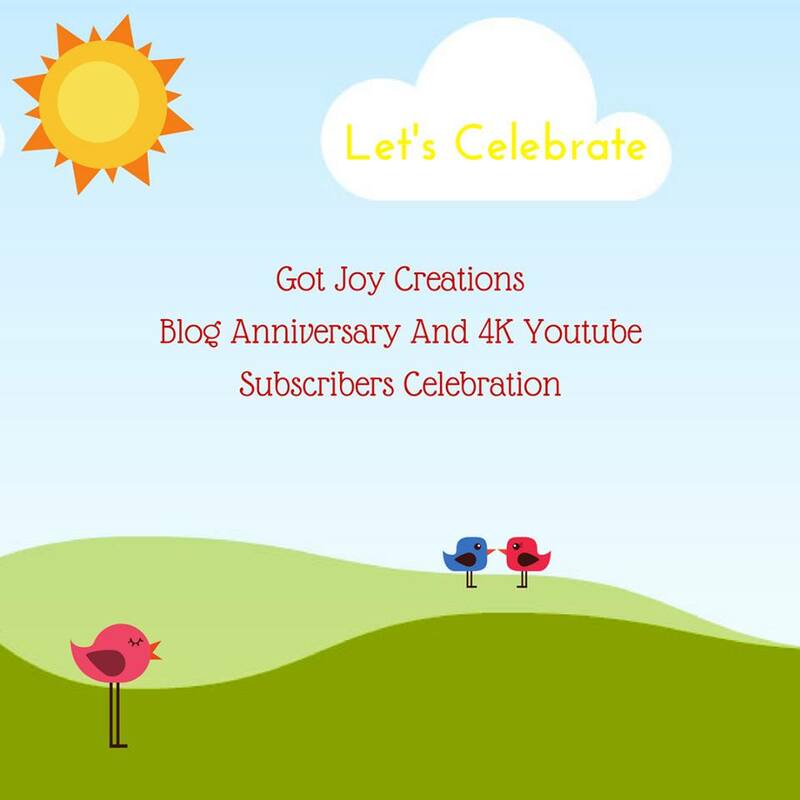 Welcome to the blog anniversary and Youtube celebration for my good friend, Dana Joy, of Got Joy Creations! We have an incredible line-up planned filled with several amazingly talented and creative ladies. All projects shared during our blog hop are inspired by creations found on Dana's YouTube channel of which each lady put their own individual spin on. The hop will run from June 30 - July 5. Because what's a hop without prizes, right?!! 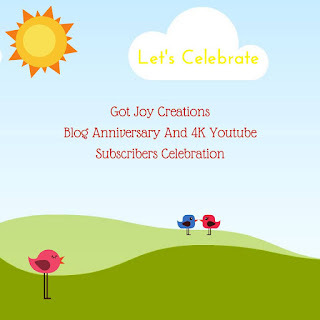 All you have to do is visit each participating blog and leave a comment on their blog hop post!! IT'S SO EASY!! See the full list of participating blogs down below. This project was so super simple! Once the base of the gatefold card was made, embellishing was a breeze! Using a 5-1/2" x 8-1/2" piece of card stock and a scoreboard, I made a crease at the 2-1/8" and again 6-3/8" marks with a bone folder. Folded the panel flaps inward and creased. I used paper from DCWV's Happy Day Stack for the card base and panels. I embellished my panel flaps with these cool flower panels from Stephanie Barnard's Half Card Panels Die set and "glitterfied" a chipboard panel underlay using my 3" sticker maker and ultrafine glitter. I used more paper from my Happy Day Stack to create the sentiment for the middle "closure". Don't forget to visit the rest of our creative friends in the line-up and comment on all our blogs for a chance to win some awesome blog candy!! The Blog Hop and Giveaway mentioned above are in no way sponsored or affiliated with Facebook, Instagram, Twitter, or any of their subsidiaries. Love these cards! WOW, so much detail and beautiful color combos. So glad we could connect through Dana's blog hop. Crafty hugs. Hi Mitsyana...I must say your one very talented person ...Your work/creations are simply Beautiful. Your card featured is Lovely. Can't wait to see your next creation ! I love your gatefold cards! 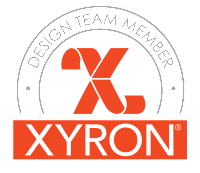 I can never get mine to work out evenly, so I am thrilled to see beautiful designs like yours! Oh my goodness Mitsyana! WOW, your gate fold card is so beautiful. I love how you used the flower panels! Hopefully this message works. I love your card. Very awesome card! The Happy Day stack is one of my favorites and I have used it SO much. I love gate fold cards and yours is simply beautiful. What a beautiful card! So pretty! I love your color choices and card design! Thanks for the inspiration and for the opportunity to win! This is beautiful. Love the intricate floral did used for your gate fold card. Wow, what a gorgeous die! Love the fold of your card and the pretty color combination. Lovely card! I love the soft colors you used and how feminine it looks. And I love glitter, too! Love the gatefold style card! Love the glitter behind the lacy part! Very pretty card! Love the colors you used and that panel die is so pretty. 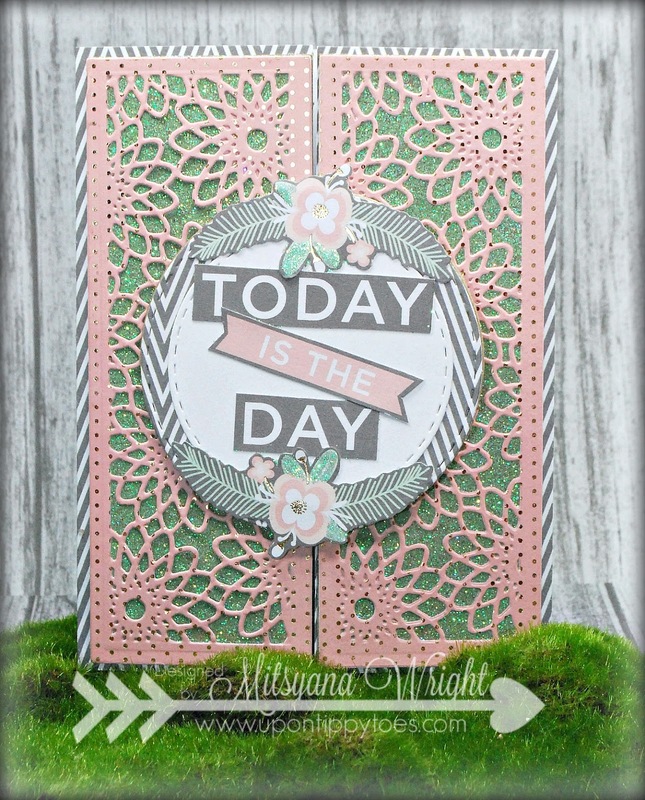 What a beautiful card, Mitsyana!!! I've never tried making a gatefold card. You & Dana have inspired me to try one now! 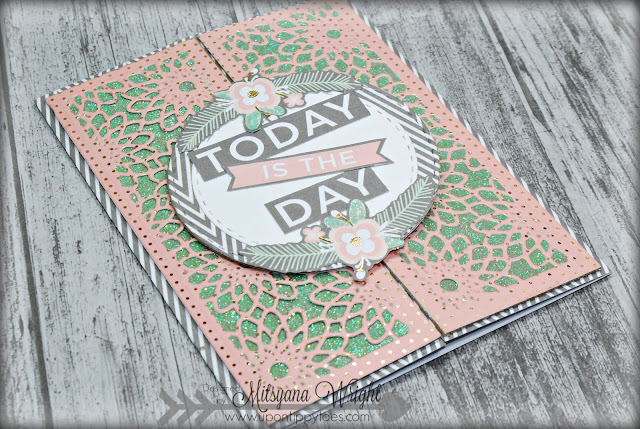 Glad to have found your blog through Dana's blog hop! I really like the color combination. It's fresh but feminine. Going to try it. 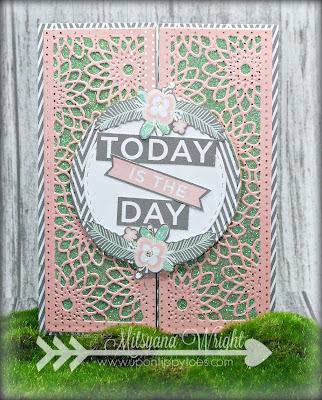 Such fun gatefold card, so beautiful with lovely color choice! Your version of the gatefold card is so sweet! Beautiful card. I really like the half panel you used. Very pretty gatefold card I like the flower panels you used. Fabulous card. Your color palette and papers are incredible! Mitsyana your card is beautiful (JUST as beautiful as Dana's!)!!! Well done! Those half card flower panels are sooo cool on this gorgeous gatefold card! Congrats to Dana! Oh my!!! Love your awesome card!!! Simply amazing!!! 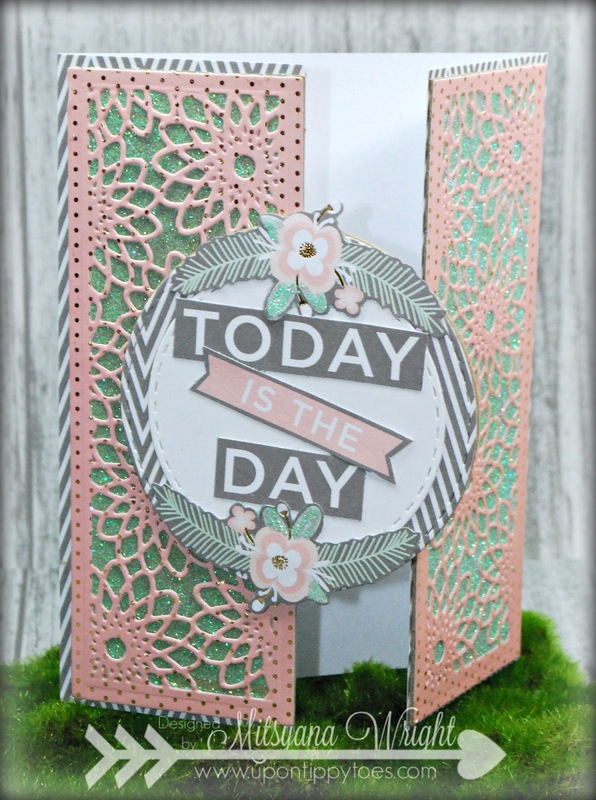 Love your gate fold card! Pretty colors and details! Gorgeous card, love the dies you've used.